Hermès offers a "spa treatment" – a reconditioning for every used bags. A "Shooting Star" Birkin has a stamp shaped like a shooting star adjacent to the "Hermès, Paris Made in France" stamp; this is in gold or silver to match the hardware and embossing. Rarely, the stamp is blind or colorless, if the bag is made of one or two leathers on which Hermès does not use metallic stamping. Birkins or other Hermès bags can sometimes be made by independent craftsmen for "personal use" once a year. Every bag bears the stamp of the crafts person who made the bag. These identifications vary widely but are not different for every bag made. More than one craftsman's stamp on a bag is not uncommon because the stamp is not a serial reference. Fonts and stamping orders may vary depending on the craftsman. The Hermès Birkin bags are handmade in France by expert artisans. The company's signature saddle stitching, developed in the 1800s, is another distinctive feature. 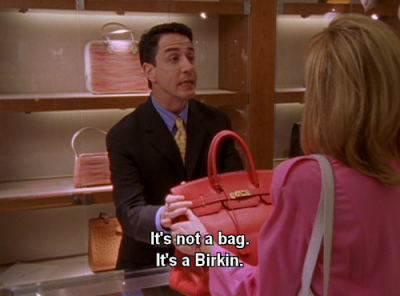 I love Birkin! I am dream about his bag! Your blog is just great, full of good information. I love it!